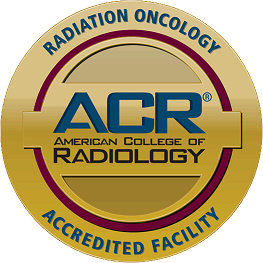 The Department of Radiation Oncology is accredited by the American College of Radiology (ACR). ACR awards accreditation to a radiation oncology group for the achievement of high practice standards after a voluntary survey of their practice. Surveys are conducted by radiation oncologists and medical physicists who are members of the ACR. They assess the quality of the work being performed by physicians and medical physicists, as well as staff efficiency, quality assessment and improvement activities including peer review, and the adequacy of space and equipment within the practice. The surveyors report their findings to the ACR’s Committee on Accreditation, which subsequently provides the practice with a comprehensive report. The American College of Radiology is a national organization servicing more than 30,000 radiologists, radiation oncologists and medical physicists. Programs focus on the practice of radiation oncology and radiology, and defining standards to promote the delivery of quality radiologic health services.